Why the State Department Needs a C-U-L-T-U-R-A-L Makeover? Some years back in A-100, one of the smallest groups of new officers hosted a senior FSO who gave the newcomers some straight talk about the Foreign Service; you know –those things that you don’t really read in the State Magazine. The folks who came in from the military and other government agencies took this in stride; they sort of understood what they were getting themselves into. The most upset were the ones who just came out of grad school and the private sector who believe that this elite service would make them all that they wanted to be. They thought that their speaker was trying to paint the Foreign Service in a bad light. They did not like what they heard and they said so. They misunderstood what their speaker was trying to do – which was, to temper their sky-high expectations with soles on your feet reality. Long intro but this brings me to No Double Standards of Calling a Spade a Spade who had been away but last week came back with a big bang with his post, It’s Time to Change the Culture. I am reblogging this here with NDS’ permission. I can promise you this – you won’t read this kind of courageous writing in the State Department’s State Magazine, DipNote, or even in its internal, behind the firewall blogs. You won’t because — self examination and self awareness are not traits of great abundance in the FS culture. These traits are not required, encouraged or talked about except perhaps in mandatory leadership and management training (basic L&M training not even required until you get to be FS-03 and most certainly securely tenured). Digger of Life After Jerusalem also has a rejoinder here which makes this snapshot of organizational life (evaluation, rewards, recognition thingies) not very pretty to look at indeed. I do worry at the back of my mind that the donkeys would soon start braying just outside NDS’ blog door for telling an inconvenient truth. “I heard a story recently about a guy who got on the elevator and looked around to see if there was anyone he considered important on it. Deciding that none of them were as important as he felt he was, he pushed the reset button so the elevator would only stop on his floor (the 7th floor, of course). He obviously was too important to waste his time letting other people get off at their floors before he got off at his, even though they were on the elevator first. Burns your biscuits, doesn’t it? I get bothered just reading it. How could someone be so inconsiderate? Why would someone so disrespect his colleagues? It’s just the sort of behavior that reinforces the very worst stereotypes of the Foreign Service and its diplomats. And I’m not talking about the jackass who pushed the reset button so he could get off first at the 7th floor. I’m talking about the rest of the passengers in the elevator. One of the lessons many parents drill into their impressionable young children is the adage, “If you don’t have anything good to say, don’t say anything at all.” A companion lesson to this one is that it isn’t polite to gossip. Those well-behaved kids grow up and join the Foreign Service. And we train them to be diplomats. We teach them to deliver a “yes” without being overly committal and “no” without somehow offending the other party. And somewhere in the middle is the cat-who-swallowed-the-canary smile that could mean either. The problem is that nearly all the Foreign Service officers I know don’t know how to switch it off. As a matter of professional practice, they lose the ability to be direct, honest and to deliver unvarnished opinions to subordinates, to colleagues, to bosses. This unwillingness to “offend” is endemic throughout the Foreign Service. You find it absolutely everywhere. The evaluation system. I’ve never served on a promotion panel, but I have worked on EER review panels. Learning to discern mediocre evaluations from positive ones is a veritable art form. You can’t simply read the text for an honest assessment; you have to determine what the rater is really saying. “I recommend that Ken be promoted, as he has demonstrated the ability to succeed at the FS-02 level” vs. “I urge that Ken be promoted at the first available opportunity, as he has demonstrated the potential to succeed at the highest levels of the Foreign Service.” A “solid” officer. You never want to be one of those. Yet I’m amazed as someone responsible for staffing nearly half a dozen posts how many of the applicants we attract are “the best young officer I’ve ever worked with.” Wow! What are the odds that the best and the brightest are ALL applying for jobs covered by my office at the same time? Lucky us! Would it surprise you to know that the Harris was awarded only once in the last three years? The Harriman only once in the last three years? The Herter only twice in the last five years? I have a little theory about the Rivkin, which is given to mid-level officers and hasn’t missed a beat: if you write a decent dissent cable as a mid-level, and it gets recognized, it’s a nice career boost. For junior officers and those in senior ranks, there’s just too much risk. But here’s the kicker: all those bureaucrats who lack the courage to speak the truth to their subordinates, to their colleagues, to their bosses? They have no scruples when it comes to gossiping about their subordinates, their colleagues, and their bosses. That’s what “corridor reputation” is all about. Imagine how useless corridor reputation would become, if everyone just delivered honest feedback. In exchange for avoiding that momentary discomfort you experience by being blunt, and the momentary embarrassment of your colleague on the receiving end of your constructive criticism, here’s the price: that colleague remains blissfully unaware of the shortcomings that need to be corrected, he carries those faults through to assignment after assignment, his growing number of subordinates are forced to deal with and compensate for them, and his own career trajectory is flattened, because no one was honest with him early on in his career. You can’t teach an old dog new tricks, so goes the adage. And it really is true. By the time an officer hits FS-01, it’s too late. Thus far, I’ve spoken only of internal Department politics. But this disease infects our foreign relations as well. We have operated on this assumption that minimal engagement with distasteful regimes is worthwhile, because at least we’ll be in the position to influence, if ever so slightly, the culture of that society. For the sake of oil or security, we’ll tolerate subjugation of women, suppression of freedom of expression, less-than-transparent elections, and institutionalized discrimination, if it serves our short-term strategic national interests. What if we tried a new approach? What if we said, “To hell with the short-term setbacks to our national interests. Let’s start being uncompromising on human rights and the exercise of democracy.” I can off the top of my head think of a dozen bilateral relationships that would suffer in the short term. But what a tremendous upside in the long term. You disagree? Did working with Saddam Hussein when it was politically expedient gain us much? Our support of Mohammed Reza Shah Pahlavi prior to 1979? Those who live under the yoke of oppression have very long memories. Totalitarian regimes fall — all of them — eventually. And when they do, we are left answering questions posed by those who take their places about where we were when those who currently rule were suffering under brutal tyrants. Do you see what I’m getting at here? The spinelessness that holds you back from an honest employee assessment is part and parcel of the same hesitation we have at delivering truth to foreign powers — to our long-term detriment. The U.S. Department of State is in need of a fundamental cultural makeover. But there’s another problem: if you decide to stand on principle and deliver honest feedback in response to 360 inquiries, write forthright assessments of your subordinates, write awards only when they are truly deserved, then you disadvantage those you work with, because everyone else is playing the game. But don’t let that stop you. The irony in all of this is that if you poll we FSOs, we’ll nearly universally insist that we’d like to be given an honest evaluation of our work, but we also nearly uniformly dread delivering that sort of feedback. The upside is far greater than the down. And whether or not your colleague agree with what you say, at least they’ll respect you, and you may even embolden them to speak forthrightly themselves. General of the United States and Foreign Commercial Service. Secretary of State Hillary Clinton vows to make Internet freedom one of the cornerstones of American foreign policy, and one senator after another issues calls to “tear down this cyber wall” and allocate more funding to groups that promote Internet freedom and fight online censorship without giving much thought to the footnotes. The spirit of techno-utopianism in Washington rides so high it often seems that the Freedom Agenda has been reborn as the Twitter Agenda—perhaps only with more utopianism about both democratization and the Internet’s role in it. Even such a seasoned observer of foreign affairs as Republican Sen. Richard Lugar of Indiana could not resist the urge to join the church of Twitter-worship, penning a Foreign Policy op-ed that urged American diplomats to engage with social media. What remains overlooked by Sen. Lugar and others is that authoritarian governments may survive the age of information abundance relatively unscathed—and in fact, they’re already using the Internet to fight the challenges posed by modernity. Diplomacy is, perhaps, one element of the U.S. government that should not be subject to the demands of “open government”; whenever it works, it is usually because it is done behind closed doors. But this may be increasingly hard to achieve in the age of Twittering bureaucrats. 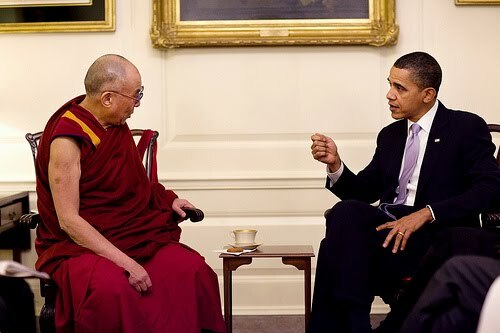 President Barack Obama meets with His Holiness the Dalai Lama in the Map Room of the White House on Feb. 18, 2010. According to the WH Museum, the Map Room is so-named because it was used by President Franklin Roosevelt as a situation room from which to follow the course of World War II. It now serves as a private meeting room for the president or the first lady. But until 1929, it had historically been used as a billiard room by many presidents, and occasionally for doctors’ visits. This is also the same room where Chief Justice John Roberts administered BHO’s oath of office the second time in 2009. More here on the Map Room from Wikipedia. at the Department of State in Washington, DC February 18, 2010. 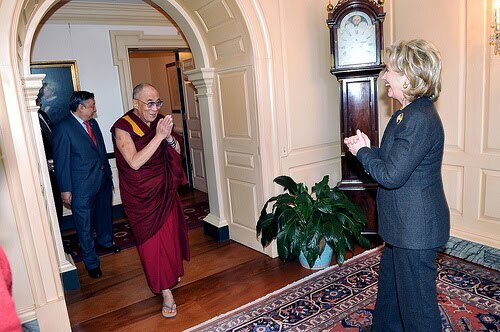 Note: Post updated on 2/24; HRC photo added.